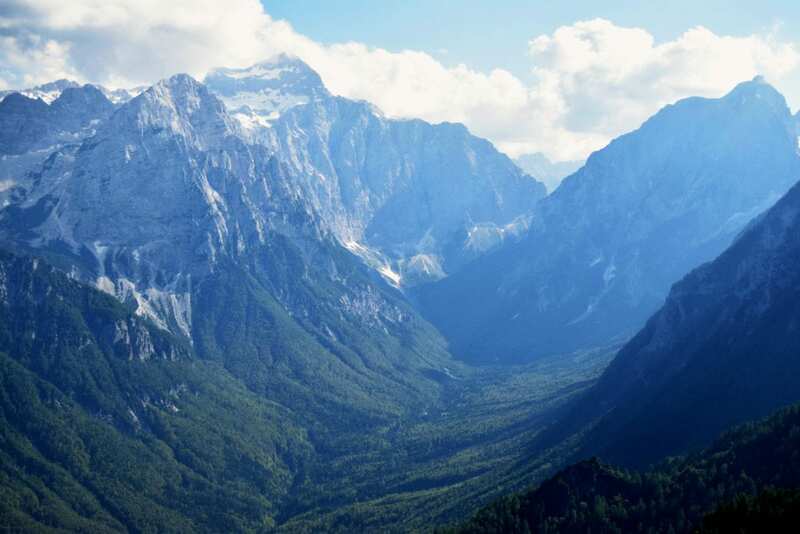 Gorgeous coastline, magnificent mountains, breathtaking valleys, crystal clear rivers and lakes, world-class caves–there are a million reasons why Slovenia’s natural beauty captured our hearts. The adorable coastal town of Piran got its own post, and the unexpectedly funky and fun capital of Ljubljana will get at least one to itself as well. Today, though, I would like to share some stunning natural sights in Slovenia (some of which you’ll no doubt recognize from Pinterest). Lake Bled, with its adorable, tiny island is quite possibly the most famous place in Slovenia, and absolutely deserves a place on any Europe bucket list. 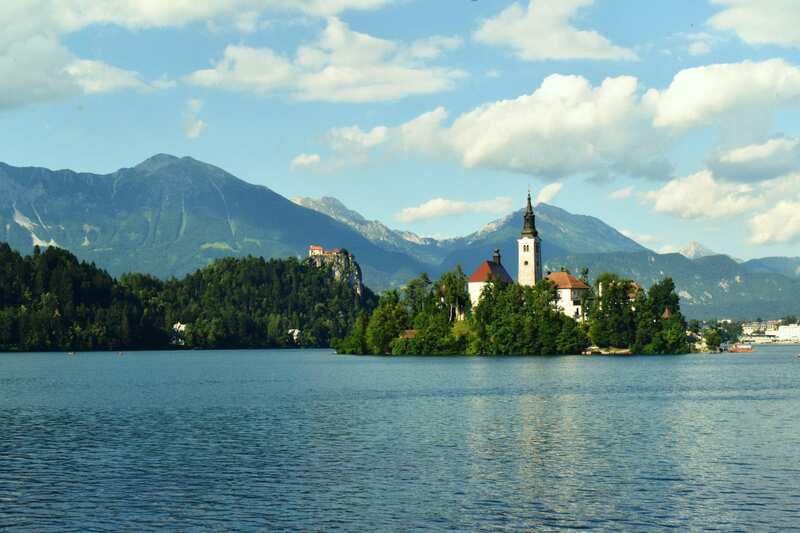 The town of Bled is very touristy in a resort-like way–Jeremy compared it to the summer camp featured in Dirty Dancing. The lake and island are beautiful, and the castle looming above them just serves to make the setting even more idyllic. We rented a rowboat (15 Euro for an hour) to head out to the tiny island–it’s only a 15 minute row to get there, and while it’s great to get a different perspective of the lake, there’s not much to do: the entire island consists of a church, a lookout tower, a small museum, a gift shop and a gelato stand. We enjoyed taking a quick look around, but had more fun spending the bulk of our hour rowing. Next time we visit the area, we will definitely do the Ojstrica hike in Lake Bled–the views from the top look absolutely amazing! 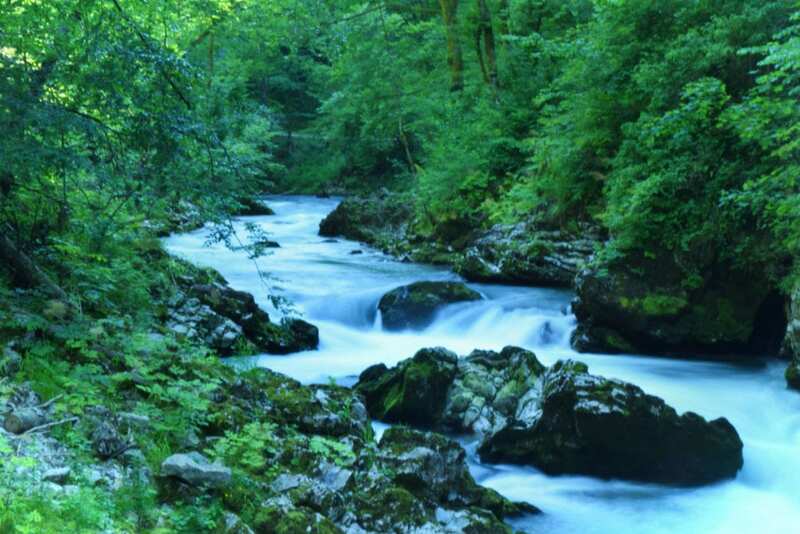 A 15 minute drive from Lake Bled and 4 Euros per person will get you access to the impressive Vintgar Gorge. The trail is made up mostly of wooden walkways suspended above and alongside the rushing river. The water is powerful, beautiful, and turquoise–my favorite color for water to be. We spent about 2 hours here, walking from one end of the main part of the trail to the other, and wouldn’t hesitate to go again. Lake Bohinj is often called the “less touristy” Lake Bled–I disagree with that assessment. There were plenty of tourists and tourist activities surrounding the lake, it was just a different kind of tourism. If Lake Bled is similar to the Dirty Dancing resort camp, then Lake Bohinj is like a neighborhood summer camp–a little less ritzy, a little more down to earth. 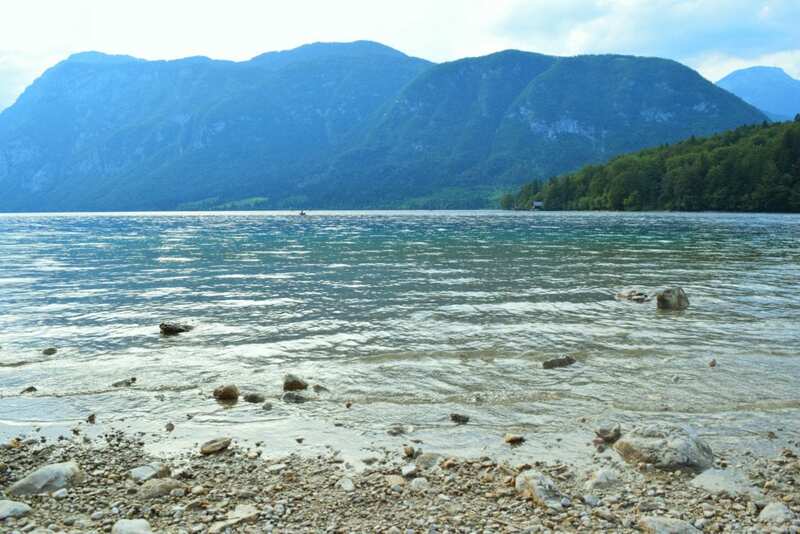 Lake Bohinj is also a bigger lake, which gives people more room to spread out, and is in a more rural setting–there are plenty of long trails and multi-day hikes that were marked as beginning nearby. 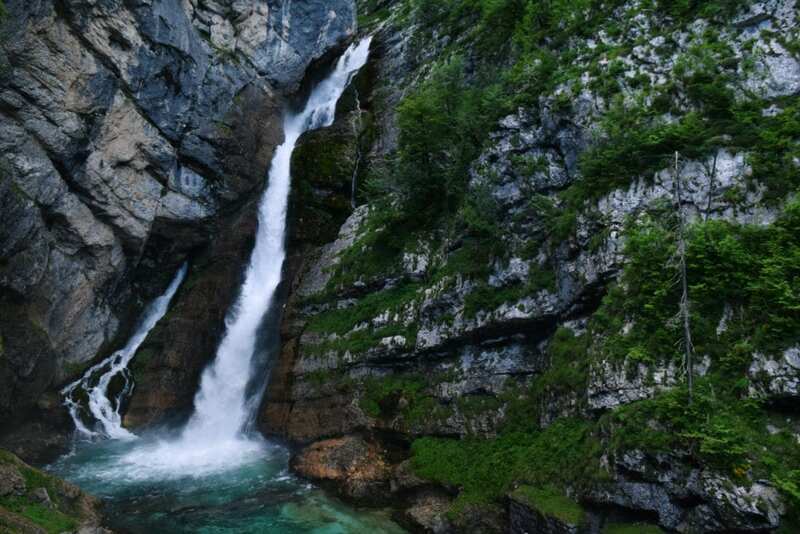 A short drive from Lake Bohinj is Savica Falls (or Slap Savica–”Slap” is the Slovenian word for waterfall, and also one of the only Slovenian words I learned). There are signs for Slap Savica along the lake and beyond that are just close enough together to keep you from turning around, and just far enough apart to keep you feeling halfway lost for the entire drive. Eventually, the road dead ends into a parking lot with a couple of shops and a sign for the trail. 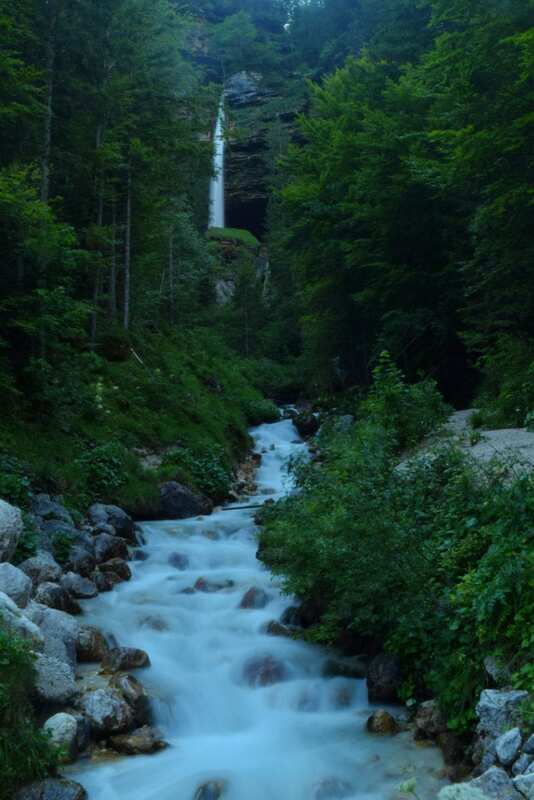 Savica Falls has a 3 Euro entry fee per person, and that and a 15-minute climb will get you an incredible view. 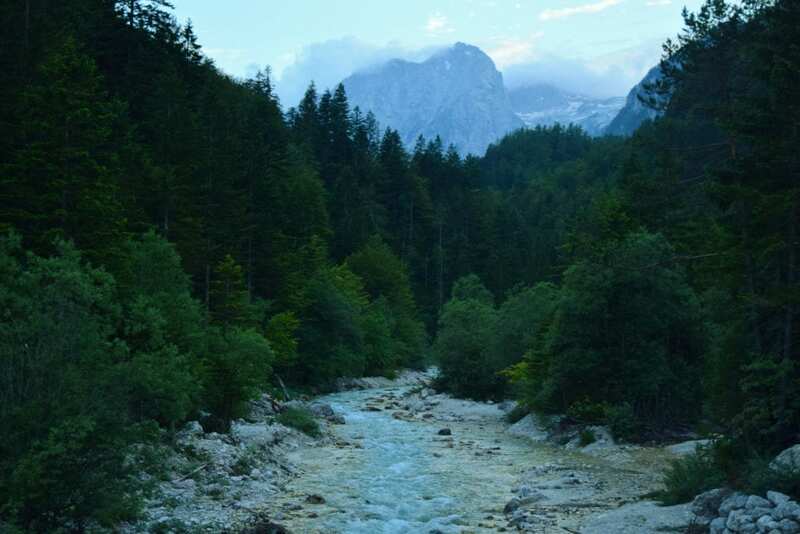 We spent a week staying just outside of Mojstrana, technically inside Triglav National Park. Luckily for us, these three locations were within hiking distance–the Soca River was just outside our door! Our Slovenia Travel Budget: Is Slovenia Expensive? The Soca River is a close runner-up to Lake Bled in being one of Slovenia’s most famous sites–this crystal clear river is ice cold, perfectly clean, and looks like a fairy tale. In places where it is slow enough for water to gather, the river turns turquoise. In faster-moving spots it is a cold, icy blue that is remarkably eye-catching. We enjoyed the river from its bank, but in towns like Bovec, kayaking and whitewater rafting are popular in the river (that’s on the list for our next trip). I’ll be honest: I found Savica Falls to be the more visually striking of the two. 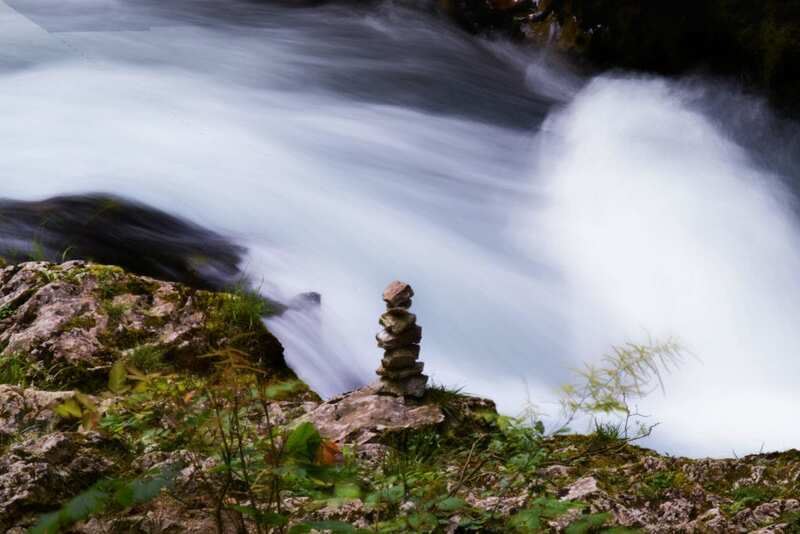 However, Pericnik Falls gives you the option of hiking up to the falls and actually climbing under them, while Savica Falls only lets you see them from a designated viewpoint that’s set at a careful distance. Plus, Pericnik Falls has that beautiful icy blue color of the Soca River that I mentioned above, so it automatically gets points for that. This is the least accessible spot on this list: the view of Vrata Valley that I fell in love with is half a day’s (very steep) hike up a mountain–you can read more about our ultimately doomed quest to reach the viewpoint of Sleme here. If you’re a hiker, though, or just want a challenge–this view is incredible. This is one of those places where you find yourself contemplating how incredibly tiny you are, and how vast the world is around you. It’s a magical place, and well worth it for those who are willing and able to put in the time. 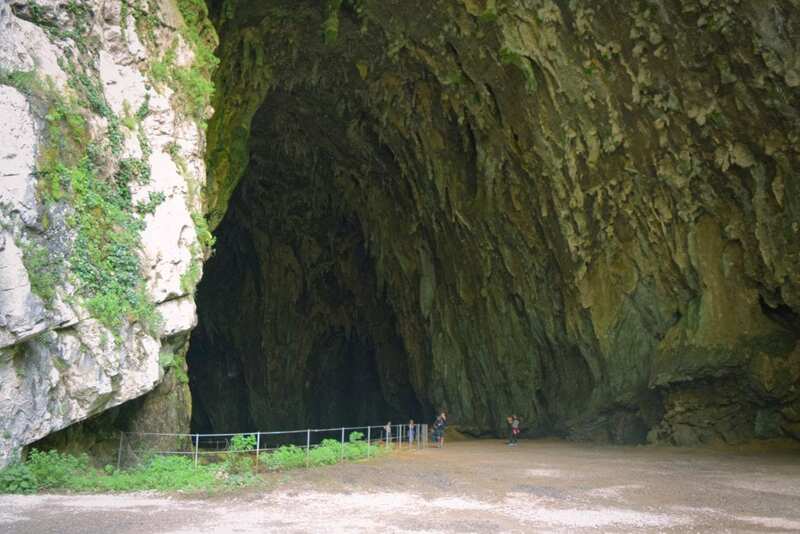 Slovenia has two famous cave systems: Skocjan Caves, which is slightly more difficult to reach (especially if you don’t have a car) and holds a UNESCO World Heritage designation, and Postojna Caves, which advertises constantly and is said to be the busier of the two. Since we only had time for one cave, we decided to go with the less-discussed, UNESCO-recognized option that also came with an underground river–who could say no to that? Unfortunately, they don’t allow photos inside the caves (though Google supplies plenty), but it was spectacular. The dry chambers are remarkable, and the cavern with the underground river is unbelievably gorgeous. 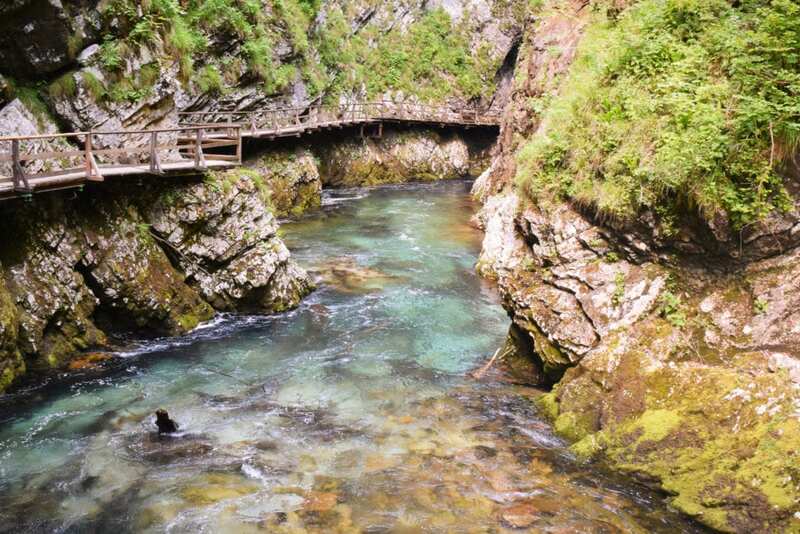 The tour takes you along a trail and bridge that are situated nearly 50 meters above the river, giving you perspective on how enormous the cavern is. I would not hesitate to see this cave again, even with the 16 Euro per person price tag. Skocjan Caves offers 3 tours, depending on how much you want to see–we chose the middle one, spending about two hours on the tour, and are very glad that we didn’t cut it shorter. While there is public transportation to access some sights in Slovenia, especially in larger towns and cities, it very is limited for exploring these natural high points. We rented a car for the week that we spent in the countryside, and I highly recommend it. Rates are fairly low (our car was about 15 USD/day, though we did more than double the cost by purchasing $0 excess/deductible insurance), and you will get so much more out of your trip. We used our car to reach almost every one of these destinations, and most of them would not have made our list without it.